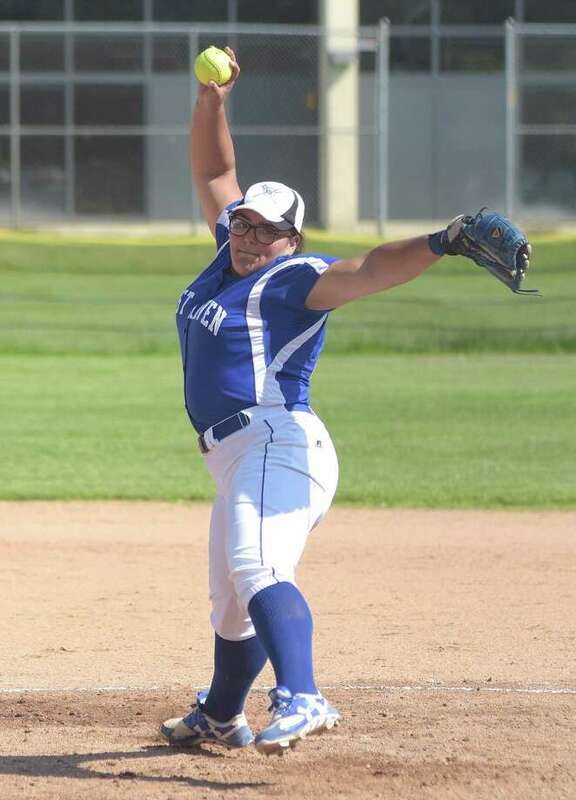 West Haven pitcher Ivy Santos has allowed two runs or fewer five times this season, including a shutout of defending Class LL champion Amity. By knocking off defending Class LL champion Amity 3-0 on that day, the Blue Devils improved to 6-0. A win over Law Friday ensured the perfect start would continue in the hyper-competitive SCC. West Haven jumped into the 10th spot in the latest GameTimeCT/Register Top 10 poll behind its undefeated start. Junior Ivy Santos has allowed two runs or fewer five times this season, including tossing the shutout against the Spartans. Santos started as a freshman and threw a shutout against Norwalk in last season’s Class LL playoffs. Offensively, Kailey Carrano has hit three home runs while playing third base. Shortstop Veronica Lynn is a four-year player while Kasey Marron has produced clutch hits at first base. Sophomore GiGi Perkins is the team’s catcher and freshman Paige Beurer guards second. In the outfield, Morgan Peryer, Ashlynn O’Keefe and Didi Rodriguez have provided stability. In total, the Blue Devils have eight seniors on their roster hungry to end their careers on a high note. A chance to compete for a championship at home at Biondi Field would be a storybook ending. West Haven last made the SCC final in 2011, falling 1-0 to Mercy. Greenwich and Brookfield have each started the season with ferocious offensive attacks putting up double-digit runs. The Cardinals, who are off to a 6-1 start, have yet to be held under 10 runs. Games this week against Ludlowe and St. Joseph will provide clarity as to how far Greenwich — which won just eight times last year — has come. The two predictably participated in a slugfest, a 13-12 affair that the Bobcats edged April 2. Valley Regional is off to a 7-0 start and gained consideration in this week’s voting. One of the biggest reasons why is ace Addy Bullis. Through five games (according to MaxPreps), Bullis has 64 strikeouts in 31 innings, pitching to a sub-1.00 ERA. Wins over H-K and Coginchaug have put the Warriors in pole position in the shoreline conference. Claire McCann, Barlow: Threw a two-hitter with 14 strikeouts in a win over New Fairfield. Threw a two-hit shutout the day before against Newtown. Tiffany Suporn, ND-Fairfield: Started her career with 10 hits in her first 10 at-bats. Went 5-for-5 while hitting for the cycle in a win over New Milford. Ivy Santos, West Haven: Tossed a complete-game three-hitter in a 3-0 win over Amity to improve to 6-0. Dominique Highsmith, Middletown: Hit a walk-off home run to seal her team’s 10-9 win over Glastonbury. Alexis Michon, Montville: Tossed a no-hitter in a win over St. Bernard. Alyssa Hackling, Bristol Eastern: Delivered the game winning hit — a RBI double — to lift Eastern past Southington 3-2 in a rain-shortened game. Diana Magarian, Stamford: Had five hits — including the game-winner — as Stamford outlasted Danbury in 10 innings. Hailee Schrader, NFA: Had four hits — including a home run and triple — in a win over Bacon Academy. Bri Pearson, Cheshire: Threw a no-hitter with eight strikeouts in a 13-0, five-inning win over Guilford. Mackenzie Bruggeman, Trumbull: Belted a pair of home runs in a 7-3 win over Ridgefield. Masuk at Newtown, Monday, 4:15 p.m.: The Panthers survived their first SWC test. Here comes another. St. Joseph at Greenwich, Wednesday, 4:15 p.m.: The Cardinals are a surprising 6-1 and have demolished opposing pitchers so far. Oxford at Seymour, Thursday, 6:30 p.m.: Wolverines are off to a 5-2 start and almost handed Seymour a loss a year ago. NFA at East Haven, Friday 11 a.m.: An SCC test for the undefeated Wildcats, who averaged 12.8 runs per game in their first five wins. Masuk at St. Joseph, Saturday, 12:30 p.m.: No. 1 takes on No. 3. For real this time. Maybe.